State Representative Ryan Guillen (D-Starr) stood alongside Rio Grande Valley legislators Sen. Juan "Chuy" Hinojosa, State Representatives Veronica Gonzales and Sergio Muñoz, Jr., William Gimson, Executive Director of the Cancer Prevention & Research Institute of Texas (CPRIT), and James Mansour, Chairman of the CPRIT Foundation and Oversight Committee, during a check presentation ceremony Aug. 17 at El Milagro Clinic in McAllen. 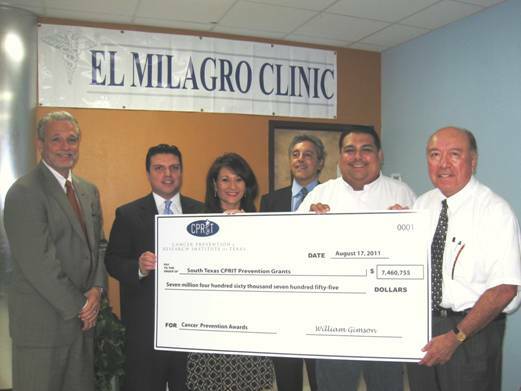 The agency presented the check to mark the more than $7 million in grant funds that it has awarded to organizations across the state that have implemented cancer prevention programs benefitting South Texans since the creation of CPRIT in 2007. Rep. Guillen coauthored HB 14 during the 80th Legislature which established the agency. Its goals include expediting innovation in the area of cancer research and enhancing access to prevention programs and services throughout Texas.